Last night, Kathleen and I went to see “The Book of Mormon” at the Pantages here in Hollywood. While we like going to see live theater a fair bit, it’s quite rare that we go see anything well-known or ‘mainstream’. 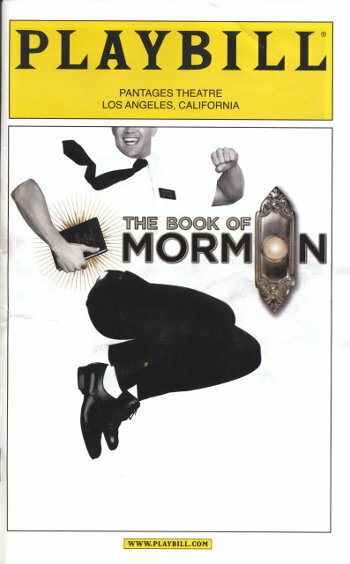 But given what we’d heard about the show, we made an exception for “The Book of Mormon”. And we were not disappointed. We started off the evening meeting up in North Hollywood and taking the train into the city. The Vine St Metro station is right across the street from the Pantages, so it was very convenient. We had dinner around the corner at Lexington Social House. It was quite nice, but the service was kind of slow. I think they could easily double their bar receipts if they just had a few more people working there to speed up delivering the drinks. When it came time, we walked back around the corner to the theater. I’d never been inside the Pantages before. It’s really quite large and ornate. And soon it was showtime. The show was hilarious. As an outsider, a good bit of Mormon theology sounds ridiculous. We’d been exposed to some of it in Julia Sweeney’s show, “Letting Go of God“. But at the same time, while they were poking fun at the Mormon religion, it was done in a good-natured way. Pretty much every religion sounds ridiculous to anyone not brought up in it. So they’re all about the same in that regard. I really can’t describe the show. But it was easily one of the funniest musicals I’ve ever seen. There were some echoes of the “South Park” episode “All About Mormons”, but much larger and livelier. If you can, go see this show. It’s a hoot.